I'm growing potatoes for the first time this year and I'm a little concerned about my progress. I planted 8 seeds on march 22 (3 weeks ago tomorrow) and I don't really see anything spouting out of the ground yet. There maybe 1 or 2 but im not sure cause i don't know what I'm looking for. My Question is, has it been enough time for them to come up or am I being impatient? I'm worried that they have rot and I'll have to re-plant and it will be to late in the season for them. Cornell University is a real good source for gardening information. Okay, I will often stop at the U of Idaho site when looking for an answer on potatoes but, considering my location, try not to make this too embarrassing for me, okay ? Cornell: "Days to emergence: 14 to 28 - Sprouts from seed potatoes should emerge in 2 to 4 weeks depending on soil temperature." Looks like you are right in the middle of that time range (depending on soil temperature). How well sprouted was the seed when you planted? You will see the soil lift and dark green, rolled leaves beginning to emerge. Cornell also says, "Do not plant seed potatoes until soil reaches 40 F." Yeah, well I think it certainly should be above 40F in my garden but not much above! I also think it had better be my potato planting day tomorrow. I decided the seed potatoes should find themselves in a warm spot for a few days since they will be taking up their garden location soon. Over the last 5 days and at only 51F in a basement "cold" room, they've been growin' just fine, thank you! At least I got them out of their paper sacks and into a box. Wishing you the Best of Luck with Your potatoes! What Steve is doing, is called Chitting, but it looks like he needs a little more light. I chit my seed potatoes, only because March was so wet, in my greenhouse. The eyes grew very short / fat, dark green stubs. I have read this will give you a larger and earlier harvest. I believe the earlier part. Wait another week and see. At four weeks I would do a little snooping. Mine were taking a few weeks too. and then we had a rogue 80 degree day followed by a very oddly early 90 degree day and the potatoes exploded out of the ground! Looked like the Thriller video or something with all of those things pushing through the dirt lol. 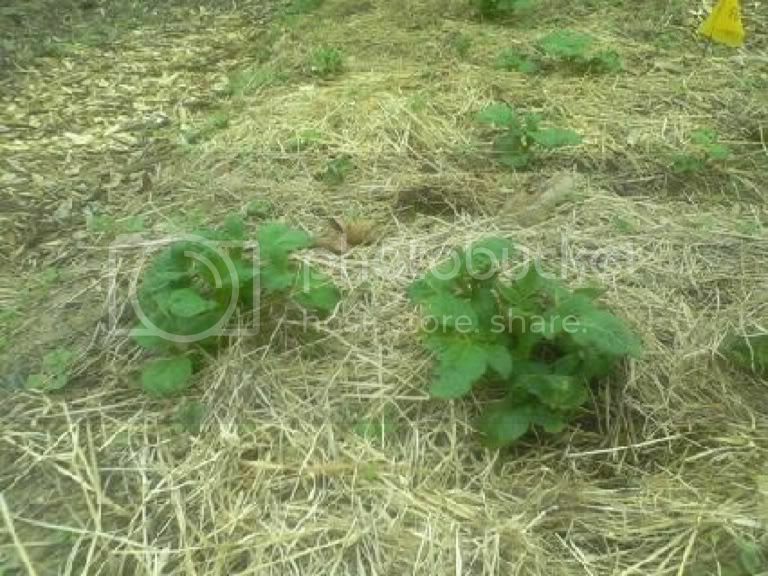 You'll be able to recognize the potato sprouts by their dark green leaves and thick stems. The plant is much more stout and thick/stiff than any weed around it will be. It's a real sturdy little plant. Like Eric said, don't be afraid to gently dig down and snoop to see what's happening under the soil. I checked mine about 4 time before they came up to make sure everything was going as planned. This was the first year I tried following the phenological indicators that applestar posted but so far so good! Potato sprouts as of this morning....about 3 days after they first broke ground. Good news I did a little bit of investigating, I carefully dug and found that all 8 were just about to pop out of the ground (about half an inch) 1 even began to form leaves. So now I have another question, I have them in a trench and I'm wondering how long it'll take or how tall they need to be before I'll have to hill them?